In terms of percentage, redwood isn’t the most widely used deck material. However, in terms of beauty, a redwood deck is unsurpassed. These are just a few of the many reasons homeowners give for installing a redwood deck. This redwood deck guide is full of reliable information about redwood’s pros & cons, price, care and maintenance and much more. 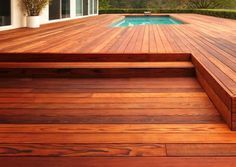 Our readers use this guide to compare redwood decks to cedar decks, pressure treated decks and those made from other popular materials. In addition to comprehensive redwood deck information, we can help you find a deck builder where you live to install the deck of your choice at the lowest prices in your area. This deck material is harvested from redwood trees native to California and a small section of Oregon. The timber is classified as either “heart” or “common.” Wooded graded “clear all heart” is the choicest material, and it is therefore 50% to 100% more costly than common redwood. Redwood decking is cut in several widths and thicknesses, and you’ll find boards from 8 to 20 feet long. The wood is quite free of resins, so redwood accepts stain and sealer very well, enhancing both its beauty and its longevity. If you intend to live in your home ten years or more, using the more expensive but better “heartwood” grade is a cost-effective decision. Redwood is not as abundant as cedar, and since it grows only on the West Coast, the material gets costlier the further East you live. For this reason, it is important to get estimates from local deck builders to know exact prices and to be able to compare the cost of redwood with the cost of cedar, pressure treated lumber, ipe and composite decking. For best results, make sure that the wood you select has been kiln dried. This means that most of the moisture has been removed, and the wood will be less susceptible to warping as it dries. The best fasteners for installing redwood decking are hot-dipped galvanized, aluminum and stainless steel. Select a penetrating sealer with a mildewcide for best results. Here are the pros & cons of redwood decks. Let’s take a look at the benefits for redwood first. There are a few redwood deck cons to consider too. How Much Does it Cost to Build a Redwood Deck? Let’s take a look at redwood deck prices, so you can estimate what your deck will cost and compare redwood deck costs with the price of others you’re considering. The pricing begins with the cost of redwood decking. Common and heartwood are the most common grades, but as you shop for redwood decking you’ll see additional terms that fall within the common and heartwood categories. These include STK (selected tight knot), sapwood, sap B, construction heart, construction common, near clear, heat B, clear and clear all heartwood. Note: Some companies will refer to redwood decking as 1.5” or 1 ½” thick while others might refer to the same thickness as 2”. The same is true with widths, with 5.5” being the same as 6”. Now, here are redwood deck costs that include all the materials required from the non-redwood substructure to the redwood decking, steps, rails and accessories. The grade of the decking is the most significant factor in the materials cost, with better grades costing more. Complex designs with stairs cost more to build than simple designs. During peak seasons for deck builders, their prices are higher. 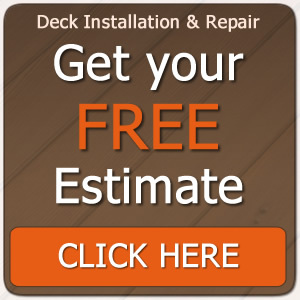 You’ll get the lowest estimates for redwood decks when you request estimates from several deck contractors in your area. Getting multiple estimates from competing companies allows you to find a qualified deck builder at the best price. 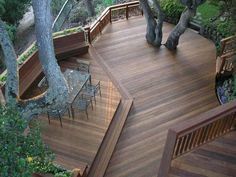 Repairing redwood decks is costlier than building new, since removing old wood and fitting in new pieces is required. While these aren’t the only brands, these producers are trusted by home improvement stores and deck builders everywhere. 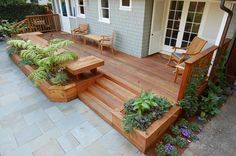 These redwood deck maintenance tips will give you the most years of enjoyment from a beautiful, durable deck. Wait one month to finish a newly installed redwood deck built from unseasoned wood. If a few drops of water sink into the wood, the redwood is ready to finish. Sanding the wood prior to finishing it opens the grain to allow for deeper penetration of the sealer. Always use a penetrating sealer when finishing redwood. One with tint in it will deepen the color of the wood while adding more protection against the wood fading in the UV rays of the sun. A coat of penetrating sealer without tint will keep the wood its natural color, which you might find the most attractive, but it won’t provide UV protection. DO NOT use varnish or polyurethane finishes or pure-oil treatments such as boiled linseed oil on redwood. Oil-based finishes that contain mildewcide and UV protectant are an excellent choice for redwood. 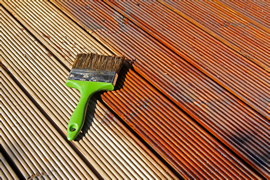 Power washing and resealing the deck every one to three years is an important part of redwood deck care. This redwood decking Q&A covers additional information that will allow you to maintain your deck’s beauty and durability. Do you have any power washing tips for redwood? Since redwood is relatively soft, never use water pressure exceeding 1,200 psi. The machine and water source you use should be capable of delivering 4 gallons of water per minute. Before you power wash, check the condition of, and make repairs to, flashing or caulking where the deck meets the house. How often should I reseal my redwood deck? In drier climates, every third year is usually sufficient. In wetter climates, every year or two is recommended. Is redwood decking renewable and sustainable? 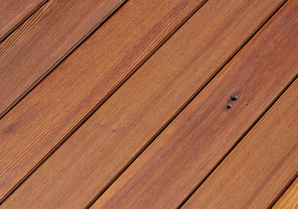 The redwood decking industry promotes this material as both renewable and sustainable. However, most old-growth woods have been cut down, and those that remain are protected. Today, the vast majority of redwood decking comes from tree farms. Old-growth, protected forests are enjoying a comeback of redwood. Paint is not a good covering for redwood, even paints formulated for shingles and shakes. It simply coats the wood rather than penetrating deeply into it. The result is that it peels off in a few years. I used an oil-based sealer on my redwood two years ago, and it keeps getting darker. What’s happening? One of the drawbacks of oil-based penetrating sealers is that they hold dirt. Consider power washing the deck keeping the precautions in mind we included in an earlier question. For those who haven’t sealed their redwood deck yet, consider a water-based penetrating tinted sealer. Water-based products don’t hold dirt as much as oil, but they don’t last as long, either, so you’ll have to reseal annually. There are dark spots on my redwood deck around the screws. What are they, and what can be done about them? The tannic acid in the redwood is reacting with the metal in the screws, and the dark staining is the result. Power washing might remove the discoloration. 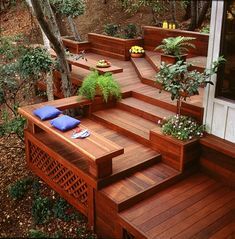 Redwood deck- I wonder if we could stain our current deck this color. Would go well with the house!